Obras An Inquiry into the Nature and Causes of the Wealth of Nations. 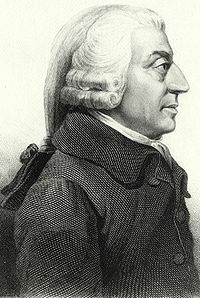 Adam Smith (5 de chunio de 1723 - † Edimburgo, Escocia 17 de chulio de 1790) estió un economista y filosofo escocés. A suya obra An Inquiry into the Nature and Causes of the Wealth of Nations (en inglés Investigación en a Naturaleza y Causas d'a Riqueza d'as Nacions) estió lo primer intento riguroso d'estudeyar o desembolique historico d'a industria y o comercio en Europa, aduyó a la creyación d'a economía como disciplina academica y proporcionó un marco teorico a lo capitalismo. Buchan, James (2006). The Authentic Adam Smith: His Life and Ideas. W. W. Norton & Company. ISBN 0393061213. Buchholz, Todd (1999). New ideas from Dead Economists: An introduction to modern economic thought. Penguin Books. . ISBN 0140283137. Bussing-Burks, Marie (2003). Influential Economists. Minneapolis: The Oliver Press. . ISBN 1-881508-72-2. Conway, Edmund (2010). 50 cosas que hay que saber sobre economía. Madrid: Planeta S.A.. . ISBN 978-84-344-6906-8. Rae, John (1895). Life of Adam Smith. New York City: Macmillan Publishers. . ISBN 0722226586. Smith, Adam (1776 ). An Inquiry into the Nature and Causes of the Wealth of Nations. University Of Chicago Press. . ISBN 0226763749. Smith, Adam (1759). Knud Haakonssen: The Theory of Moral Sentiments. Cambridge University Press. Smith, Vernon L. (Juliol de 1998). "The Two Faces of Adam Smith". Southern Economic Journal 65 (1): 2–19. Tribe, Keith, Mizuta, Hiroshi (2002). A Critical Bibliography of Adam Smith (Hardcover), Pickering & Chatto. ISBN 9781851967414. Cerqueira, Hugo. Sobre a filosofia moral de Adam Smith. Síntese - Revista de Filosofia, v. 35, p. 57-86, 2008. Cerqueira, Hugo. A mão invisível de Júpiter e o método newtoniano de Smith. Estudos Econômicos, v. 36, p. 667-697, 2006. Cerqueira, Hugo. Para ler Adam Smith: novas abordagens. Síntese - Revista de Filosofia, v. 32, n. 103, p. 181-202, 2005. Cerqueira, Hugo. Adam Smith e o surgimento do discurso econômico. Revista de Economia Politica, v. 24, n. 3, p. 422-441, 2004. Viner, Jacob (1991). Douglas A. Irvin: Essays on the Intellectual History of Economics. Princeton (Nova Jersey): Princeton University Press. ISBN 0691042667. Se veigan as imáchens de Commons sobre Adam Smith. (en) Biografia d'Adam Smith en l'Adam Smith Institute. (en) Obras d'Adam Smith en Open Library. (en) Pachina web d'os Premios Adam Smith (Adam Smith Awards en anglés). Zaguera edición d'ista pachina o 13 chul 2015 a las 21:04.